Fun festivals and events, along with stunning colors of the mountains, make fall a great season to visit Virginia’s Blue Ridge. It’s a special time of year in the region, with the calendar full of popular annual festivals, farmers markets featuring the bountiful local harvest, and cooler temperatures that are perfect for enjoying the rich variety of outdoor activities, including hundreds of miles of trails for hiking and biking. 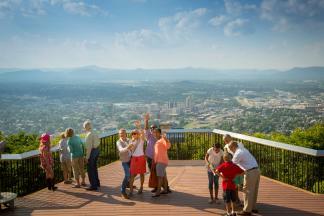 Here are a few events you can check out during your next fall getaway to the Blue Ridge Mountains . 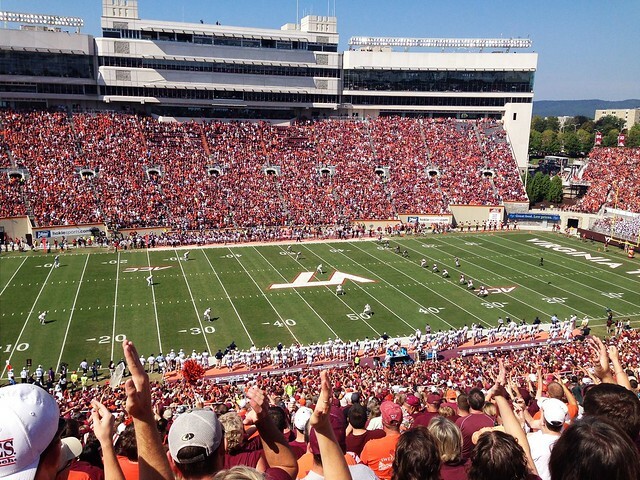 College football is one of our favorite fall traditions in Virginia’s Blue Ridge! Whether you’re watching the Virginia Tech Hokies in action at Lane Stadium in Blacksburg, or making your way to Ferrum College to see the Panthers, a Blue Ridge Gameday is always a fun experience. Nothing says “fall” like a visit to a farm in the heart of the Blue Ridge Mountains. Jeter Farm and Layman Family Farms are two local spots that offer a variety of family fun. 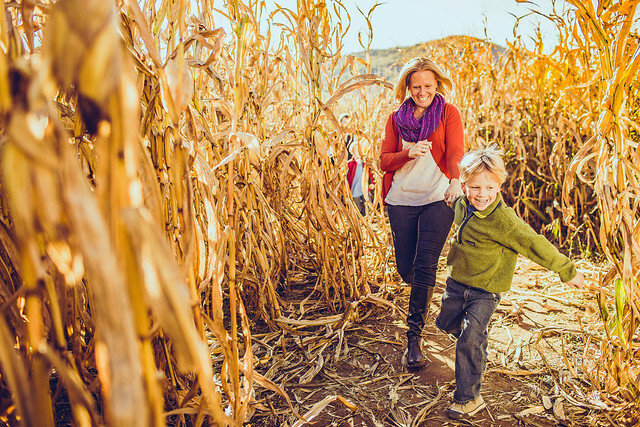 Get ready for pumpkin picking, racing through a corn maze, hay rides, and making special memories. 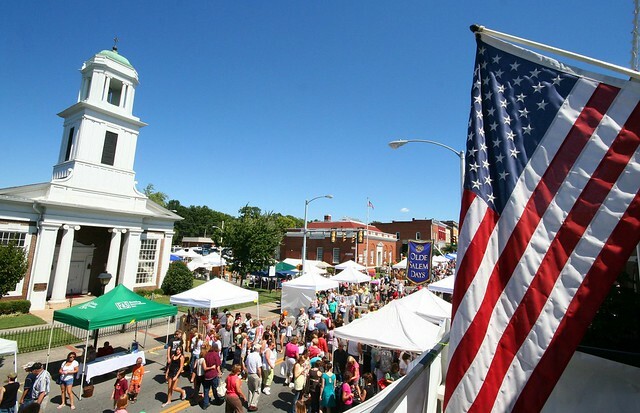 The charming Main Street of Downtown Salem is the setting for Olde Salem Days, one of Virginia’s biggest arts & craft festivals. Started in 1982, the festival features a variety of original, handmade, one-of-a-kind items from local artists, jewelers, craftsmen and more. The festival also includes classic cars, delicious food, and live music. Livestock shows, tractor shows, great live music, agricultural exhibits, midway rides, and lots of fun all make the Franklin County Agricultural Fair a special annual event. The 4-day festival adheres to the classic purpose of agricultural fairs of bringing the community together as a way to celebrate the bountiful harvest, and visitors are invited to join the party. It’s all Greek to us at the annual Roanoke Greek Festival ! The annual celebration at the Holy Trinity Greek Orthodox is one of the region’s most popular food festivals and highlights the influence of Greek culture in Virginia’s Blue Ridge. Music, dancing, Greek products, and signature Greek foods such as baklava and moussaka are all on the menu. Opa! 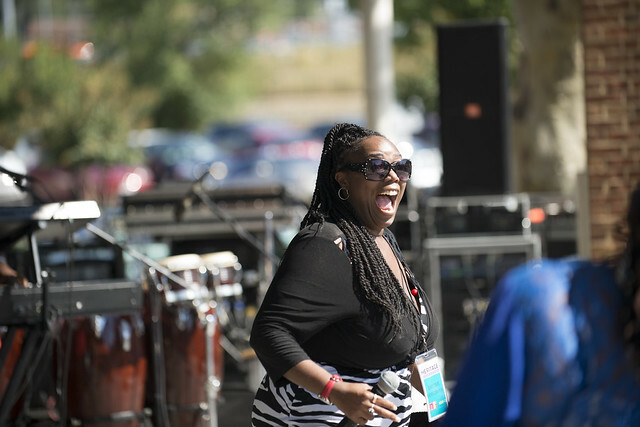 Every fall, the Harrison Museum of African American Culture hosts the Henry Street Festival as a celebration of African-American heritage through performing arts, crafts, cuisine, customs, and merchandise. The talent show provides the opportunity for local performers to show off their abilities, and we’re always jealous of the judges who get to participate in the Dessert Contest. Drink in the flavors of Virginia vineyards and wineries along with the beautiful views of Smith Mountain Lake at this popular annual wine festival. 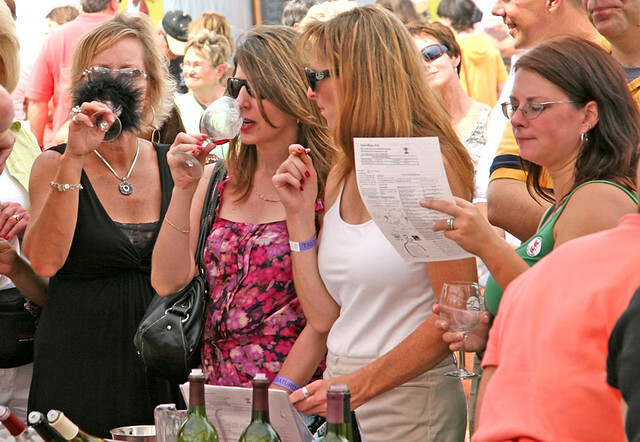 For over 25 years, the Smith Mountain Lake Wine Festival has showcased the varieties of local, award-winning wineries from around the region, as well as other well-known wineries throughout the Shenandoah Valley. There is also a great selection of food and craft vendors, and live music for entertainment. The Roanoke Pride Week concludes with the annual Pride in the Park event. This community celebration, which is sponsored by LGBTQA businesses and organizations in the region, includes a pride parade, block party, tons of live music, and a one-of-a-kind drag show. 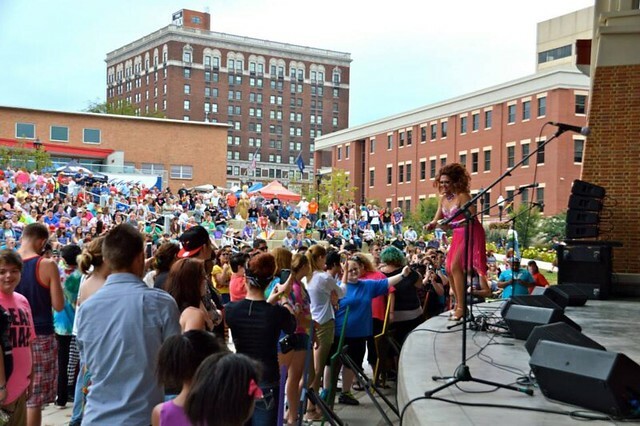 Every year, this is one of Downtown Roanoke’s biggest, most colorful parties. Break out the lederhosen and get ready to drink some Marzen beer at an Oktoberfest celebration in Virginia’s Blue Ridge! Visitors will have a couple chances to experience the local version of this classic German festival. Make some new friends at the party at Chaos Mountain Brewing Co. or head over to the Smith Mountain Lake Oktoberfest. Actually...why not go to both?! The GO Outside Festival is three days jam-packed with incredible outdoor activities, live music, demonstrations, and everything that celebrates the awesome outdoor culture in Virginia’s Blue Ridge. 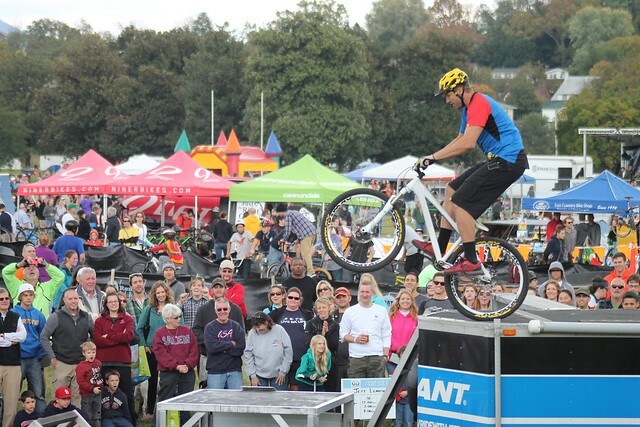 You can be a spectator for fun things like BMX stunt shows, the Ultimate Air Dogs, or the Lumberjack Show, or you can take part in the fun by trying out some new gear from on-site vendors or joining one of the many races. The Blue Ridge Folklife Festival at the Blue Ridge Institute & Museum has been praised by the New York Times for being “thoroughly authentic.” It’s an event that brings together musicians, moonshiners, farmers, craftspeople and others who share in the folklife traditions and ways of life that have helped shape the culture of the region for years. The festival takes place on the fourth Saturday of October. 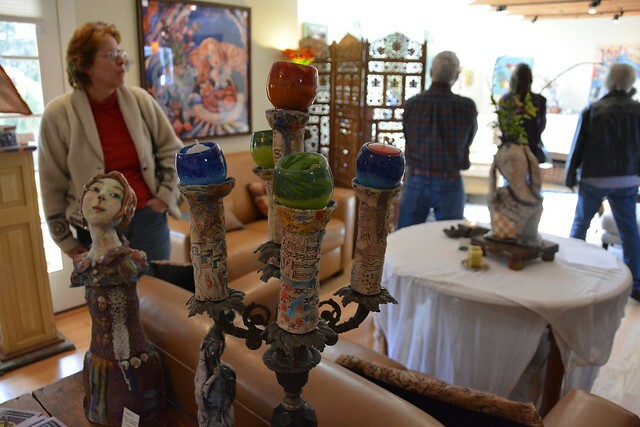 Open Studios - Botetourt is a self-guided tour of artist studios in Botetourt County in Virginia’s Blue Ridge. It’s a great way to get to know the work and stories of local artists in Virginia’s Blue Ridge, who showcase their art, including things that are both in progress and completed. Many studios provide the opportunity to purchase work, and it’s not uncommon to find an impromptu demonstration. 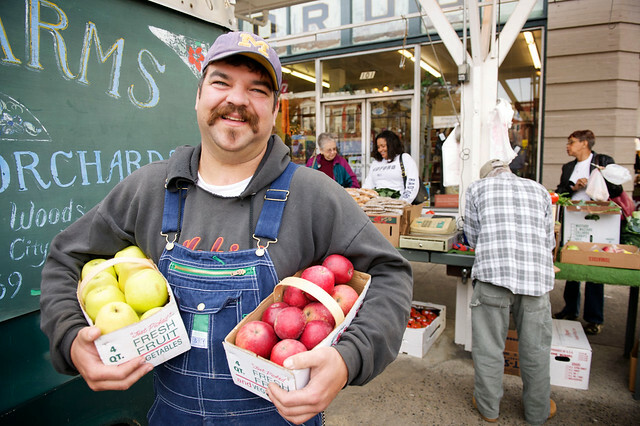 Many local farmers markets in Virginia’s Blue Ridge also become the sites of fall festivals. It’s a perfect way for the entire family to get to experience the local culture, and there are often special activities and events planned that highlight the season. Check the calendar for fun events like the Vinton Fall Festival, Craig County Fall Festival, Downtown Roanoke Harvest Festival, Salem Pumpkinfest and more! 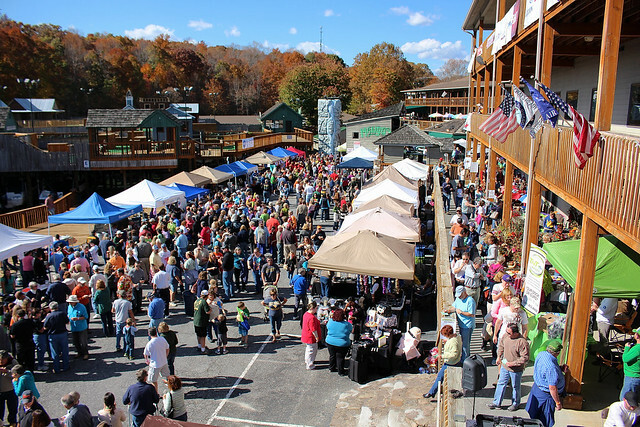 Bridgewater Marina is the place to be for the Smith Mountain Lake Chili & Craft Festival ! Find your favorite batch of chili from a selection of local vendors who are competing for the prize of the festival’s best chili, and pick up some crafts that could serve as gifts for the upcoming holiday season. 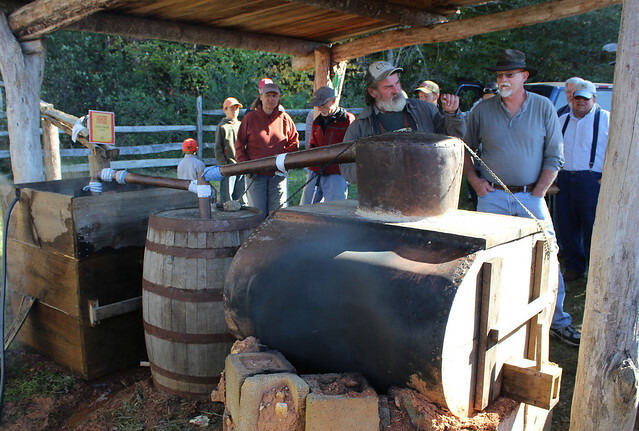 This list of featured events is only a sampling of what happens during the fall in Virginia’s Blue Ridge. Check out our Calendar of Events for a complete list of what’s going on in the region and don’t forget to subscribe to our e-newsletter for monthly updates and special features. 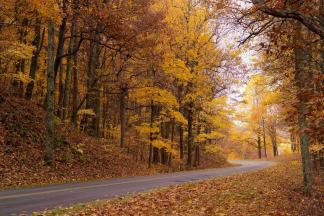 Find the perfect spots to see the vibrant fall colors of Virginia's Blue Ridge Mountains.